The 2017 Summer of Heroes honorees are (from left to right): Quincy Taylor, Aunika Alch, Wilton Charles, Avery White and Addie Epler. Not pictured: Mae’jon Dar Cawyer. (Aug. 28, 2017) – Alaska Communications, in partnership with Boys & Girls Clubs – Alaska, announced its six 2017 Summer of Heroes youth heroes Sunday, Aug. 27, at the Alaska State Fair. At the ceremony, Diedre Williams, vice president, human resources, at Alaska Communications, joined Alana Humphrey, CEO of Boys & Girls Clubs – Alaska, to recognize this year’s honorees for their community service efforts and present each youth with a $1,500 scholarship check. Now in its seventh year, the Summer of Heroes program promotes awareness and support for youth development programs throughout the state. 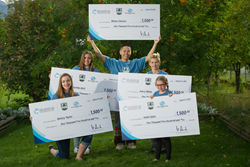 As part of the program, Alaska Communications and Boys & Girls Clubs – Alaska recognize youth who make significant contributions to his or her community through acts of charity, bravery or achievement. Aunika Alch, age 16, Anchorage – Aunika Alch decided at a young age that she wanted to shine light into the lives of those struggling, particularly those facing homelessness in Alaska. Aunika launched the local chapter of the national organization #HashtagLunchbag, a nonprofit that asks volunteers to help donate to and help prepare bagged lunches for anyone who needs a small meal. The lunches include a well-rounded meal, along with a handwritten note reminding the receiver they are important and loved. Over the past 18 months, #HashtagLunchbagANC has fed 4,300 people in the community. Aunika works directly with local businesses for donations, as well as with organizations, such as Bean’s Café and Henry House, to donate lunches and feed patrons in need. In the future, Aunika hopes to expand the program into the surrounding communities in Alaska and to increase the number of lunches produced. Mae’jon Dar Cawyer, age 17, Anchorage –Mae’jon Dar Cawyer fell in love with telling stories after listening to her dad recite fictional narratives to entertain her as a young girl. She often chimed in as he spoke, adding various plot details to his stories. A few years later, Mae’jon became the youngest published Yup’ik Eskimo author in Alaska. At age 10, she channeled her passion for wildlife preservation, particularly bald eagles on the Prince of Wales Island, into publishing “Bald Eagles of Alaska,” which includes facts about bald eagles. By age 12, she had already published her second book, “Talon’s Adventure: The Beginning,” which tells the story of a retired sled dog who is no longer able to pull sleds. Mae’jon uses the money she receives from her book sales to purchase additional copies, as well as stuffed animals that she distributes during the holidays to pediatric patients at the Alaska Native Medical Center. The past couple years, Mae’jon has held a seminar for Alaska Native students to explain how she began writing and how she’s gotten her books published. After high school, Mae’jon plans to attend nursing school and eventually become a veterinarian. Wilton Charles, age 18, Toksook Bay – Recognizing that suicide is a major issue in his home village of Toksook Bay, Wilton began working with the American Foundation for Suicide Prevention (AFSP) in eighth grade. That same year, he helped organize the International Survivors of Suicide Day at Nelson Island School. Wilton continues to work with local community leaders, as well as state and government officials, to raise awareness of suicide and help develop solutions. In March, he spoke about suicide in rural villages at the inaugural State Capitol Day for the AFSP Alaska Chapter. Next summer, he will meet with Alaska’s government officials in Washington, D.C. to discuss the epidemic. Additionally, Wilton was the 2017 Native Youth Olympics kneel jump champion, and he participates in basketball, volleyball and Yup’ik dance. Wilton would like to attend Kansas State University or Arizona State University to study political science. No matter where his future takes him, he says he will always come back to Toksook Bay and consider it his home. Addie Epler, age 7, Ketchikan– For being only seven years old, Addie Epler has already had a big impact on her community. One of her greatest accomplishments includes petitioning local government for playground renovations at her local park, gathering friends and family to help clean up the playground and applying for a grant to pay for new equipment. Her efforts were highlighted in a Disney Channel commercial about young people who are active in their communities. Additionally, this year, Addie held an Ice Cream for Breakfast event at the public library where she handed out hundreds of free books to promote literacy for children. Following the event, she and others took books to the Pioneer Home to read aloud with elders who couldn’t make it to the library. Addie’s dream is to eventually become the President of the United States. Quincy Taylor, age 17, Anchorage – When Quincy Taylor was appointed as the student member of the Anchorage Municipal Library Advisory Board (LAB) in December 2016, she had no idea the role would transform her into a community hero. After learning the library’s computer-use policy didn’t ban the viewing of inappropriate websites on library computers, Quincy wrote a petition to prohibit explicit materials and spoke with local media to promote it. She then presented the results of the petition to the LAB, and they voted unanimously to update the policy and prohibit viewing of inappropriate content on the library computers. Quincy is also an active volunteer at the Kids’ Kitchen, and she recently launched an afterschool tutoring program for underprivileged kids at the Spenard Recreation Center. This summer, she and her friends listed 100 acts of service to complete in one week – putting grocery carts away in parking lots, picking up trash in parks and more. Quincy hopes to attend a military academy for college, where she plans to major in electrical engineering and become a pilot. Eventually, she’d like to hold a position in public office to write and support legislation to improve the quality of life for others. Avery White, age 13, Eagle River – In just a few years, Avery White has racked up more than 260 hours of volunteer work. During the summer, Avery volunteers at the Eagle River Boys & Girls Club several times a week to lead other Alaska youth in games, help them with their homework and teach them about problem resolution. This summer, Avery spent several days volunteering at a children’s hospital. He supported a spaghetti feed to help provide meals and general health screenings for the less fortunate members of the community. The event was free of charge and helped raise awareness about undiagnosed health issues such as pre-diabetes. Additionally, Avery hosted a Just Dance booth for hospitalized children and other community members with difficult medical situations. Avery is also passionate about helping animals. After a Chihuahua terrier mix was rescued by Alaska Animal Rescue Friends (AARF) from a hoarding situation, Avery fostered the dog for two months before he became a permanent member of the family. He hopes to join the Air Force Academy for college and serve in the military. Avery is the recipient of the 2017 Summer of Heroes employee hero award, which recognizes a child of an Alaska Communications employee. Since 2011, the Summer of Heroes program has recognized Alaska’s youth heroes, and this year brings the total youth heroes awarded with $1,500 scholarships to 42, for a total of $63,000 in scholarship funds donated. In addition to the scholarship program, Alaska Communications also pledged to donate $25 to Boys & Girls Clubs – Alaska for every new Unlimited or Business Internet contract signed during the nomination period, up to $15,000 total. The final donation amount will be announced during Boys & Girls Clubs – Alaska’s 2017 Driving Great Futures Gala on Sept. 16. In the first six years of the Summer of Heroes program, Alaska Communications contributed a total of $90,000 to Boys & Girls Clubs – Alaska to support the non-profit’s high-quality youth development programming throughout Alaska. For full biographies of each Summer of Heroes scholarship recipient and more information about Alaska Communications’ work in the community, visit http://www.alaskacommunications.com/summerofheroes. Alaska Communications is the leading provider of advanced broadband and managed IT services for businesses and consumers in Alaska. The company operates a highly reliable, advanced statewide data network with the latest technology and the most diverse undersea fiber optic system connecting Alaska to the contiguous U.S. For more information, visit http://www.alaskacommunications.com.